Cracks in the tribes are becoming more apparent, which sets plenty of targets out there for the voting. 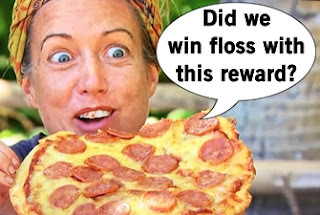 While a pizza party reward temporarily satiates the Soko tribe, Ali is still seething that Ryan lied to her and left her out of the vote to blindside Roark. But at least Ali is a known entity unlike the human form of an unscented candle, JP, who brings nothing strategically and is just counting down the minutes until challenges. Over on Yawa, Cole continues to annoy the tribe with his incessant eating like a greedy Mogwai after midnight. Turns out Cole's muscular physique is struggling for nutrition and briefly faints, sending healers Dr. Mike and Jessica to the rescue, but also setting off red flags that maybe his body isn't in this game for the longhaul. Ashley and Devon continue trying to turn Desi to their side to vote Joe off of Levu, but he's off successfully finding his second Hidden Immunity Idol (again by the well but this time it's four feet away instead of five feet - what a gamechanger). Twisting up the format, the stack and spell "IMMUNITY" Immunity Challenge is turned into a tribe challenge which calls for teamwork and a steady hand. All the tribes falter and flub but Soko ultimately loses and is headed to Tribal Council again. Knowing she's on the outs, Ali approaches Chrissy to pledge allegiance and move forward together. JP's challenge prowess and post-merge Immunity threat provides a glimmer of hope for Ali, which she tries to sell to Chrissy and Ryan. Chrissy and Ryan are elated to play the game together and make the decision of who will be easier to beat when they merge. Tribal Council time! 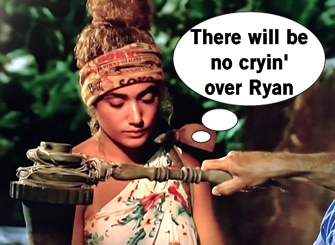 Probst asks for a recap of the last blindside, which Ryan defends as Roark was a threat that would've re-aligned with the Healers at the merge. Ali assures the group she's over being left out and ready to move forward in the game together. JP acknowledges being a physical threat but also doesn't give much valuable info, which is part of the mystery of JP's "game." Ali hopes the relationships were mended but the vote says otherwise. Ali is voted out of the tribe just shy of the merge.